Figures 1A-B. 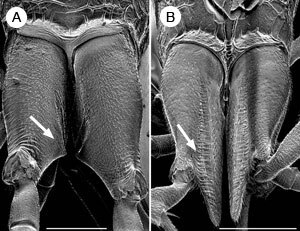 Wings of females of (1) Aulacus houstoni Jennings et al. (2) Pristaulacus davisi Jennings et al., from Western Australia. Scale bars = 1 mm. ? John T. Jennings. Figure 2. 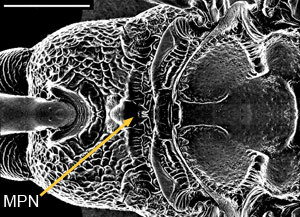 Dorsal view of scutellum of Aulacus douglasi Jennings et al. female from Western Australia; MPN = metapostnotum. Scale bar = 1 mm. ? John T. Jennings. Figure 3. 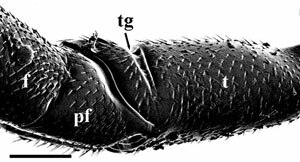 Lateral head and scutum of Pristaulacus mouldsi Jennings et al. female from Western Australia. 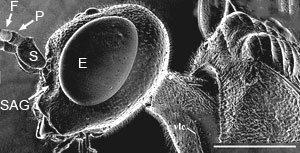 F = flagellomere, P = pedicel, S = scape, E = eye, SAG = sub-antennal groove. Scale bar = 1 mm. ? John T. Jennings. Figures 4A-B. 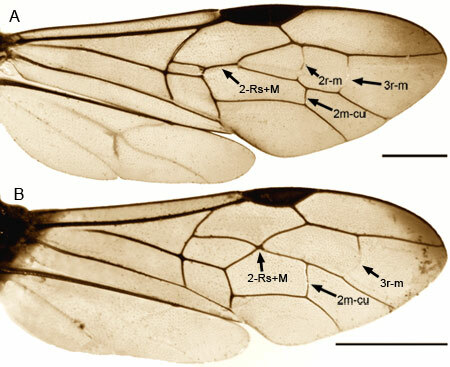 Dorsal view of hind coxae with ovipositor guide (arrowed) of (A) Aulacus coracinus Jennings et al. and (B) A. emineo Jennings et al., both female and both species from New Caledonia. Scale bar = 500 ?m for A; 200 ?m for B. ? John T. Jennings. Figure 5. Lateral view of hind trochanter, prefemur, and femur of A. douglasi Jennings et al. female from Western Australia. tg= trochanteral groove, pf = prefemur (trochantellus), f = femur. Scale bar = 200 ?m. ? John T. Jennings. School of Computational Science Florida State University Tallahassee, FL 32306 U.S.A.